Looking for a festive main course that's quite easy? 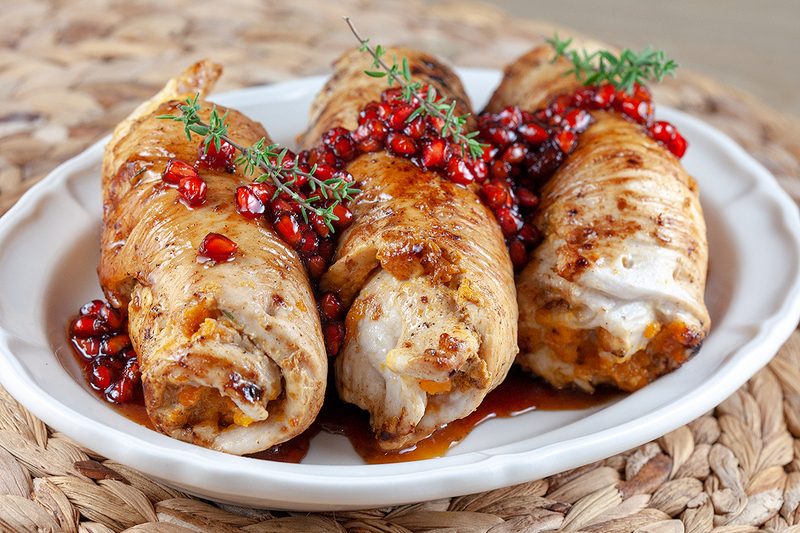 These turkey rolls with pomegranate and carrot are ready within half an hour. Start with a carrot puree for the filling. RINSE and peel the carrots, divide them into small pieces and cook them in boiling water. 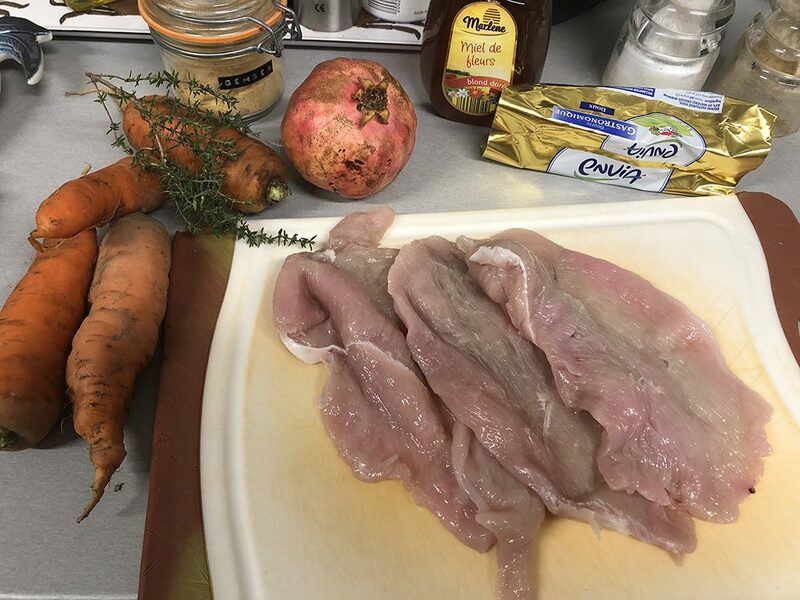 The exact cooking time depends on the size of the carrot pieces. Meanwhile get the pomegranate seeds out of the pomegranate. The easiest way to do is, is by dividing it into half and tapping on it using a wooden spoon. You’ll notice the seeds will fall out very easily! DRAIN the carrots as soon as they’re soft, create a puree using a vegetable mill, immersion blender or fine sieve. Make sure the puree is as dry as possible and SEASON with half a teaspoon ground ginger, pepper and salt. Make sure the turkey breasts are thin. DIVIDE some thyme leaves along with some pepper and salt over the turkey breasts. DIVIDE a thin layer of carrot puree onto about 3/4th of the turkey. ROLL up the turkey and close it up using small wooden skewers. HEAT a knob butter along with a dash of olive oil in a skillet and cook the turkey a few minutes on all sides. 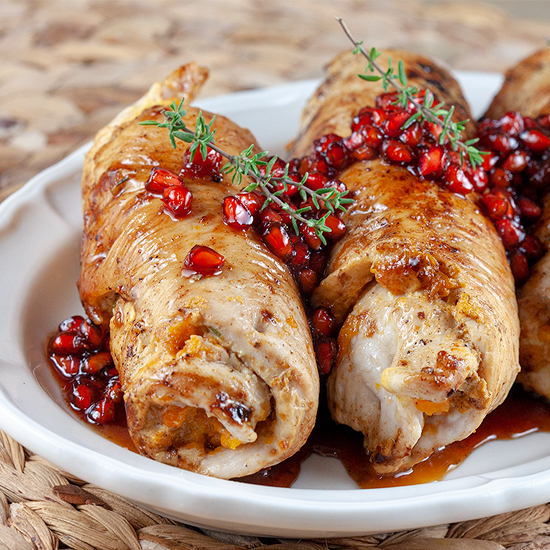 TRANSFER the turkey rolls to a plate and ADD honey and pomegranate seeds to the pan. Let the sauce reduce a bit, SEASON with pepper and salt and transfer the turkey back to the pan. 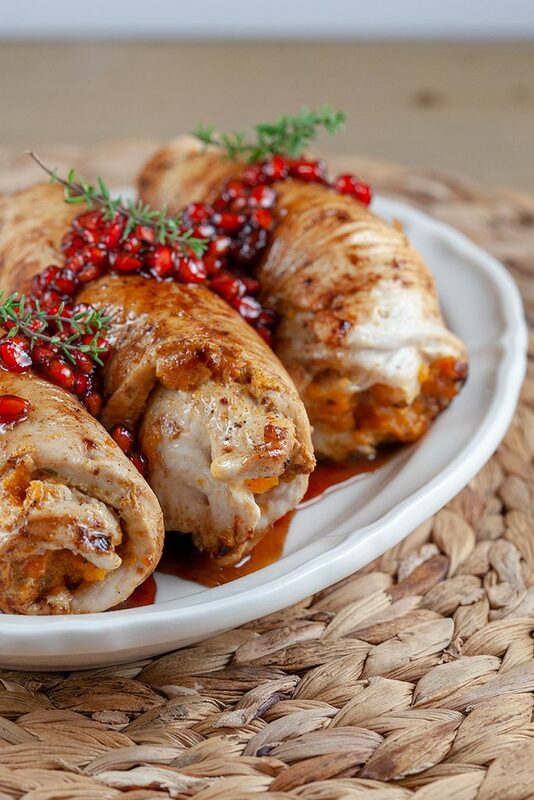 Let it heat a bit and serve the turkey rolls immediately with honey sauce. Enjoy!